FedEx first showed up as an idea on Frederick W. Smith’s college term paper. Facebook was born in Mark Zuckerberg’s dorm room at Harvard. What will your story be? If you’re a student entrepreneur, Study Magazine wants to hear from you! 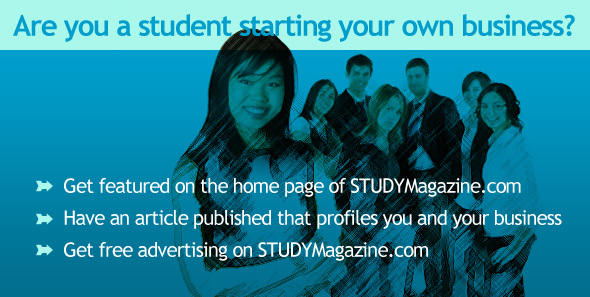 Get free advertising for your student-run business or start-up. We’ll profile you in our “Entrepreneur Highlight” section, which means front-page coverage for you, and exposure on our Facebook, Twitter and other feeds. We’re looking for visionary students who had the courage to take their ideas from the whiteboard to the real world. We want to applaud visionary students like yourself and give you the opportunity to inspire and motivate other like-minded students and graduates. Email us today and tell us more about your start-up or business.